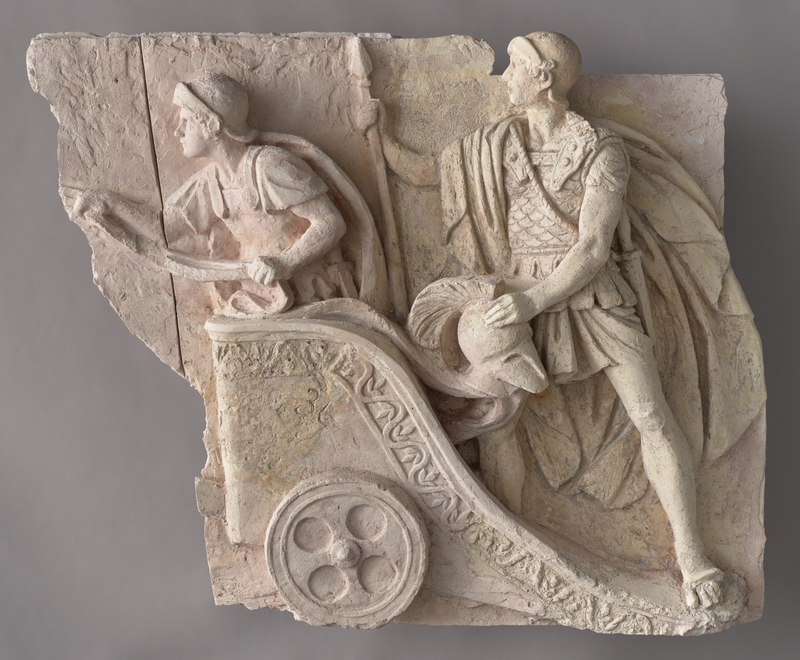 The stucco relief, which was originally located on the frieze above the main entrance to the Grand Theatre, comprised approximately 90 figures. The sculptor Paweł Maliński (1790-1853) portrayed three altars towards which residents and soldiers head on foot, riding horses and in chariots. Some of the figures carry propitiatory bundles – laurel tree twigs deposited on altars. A note from Gazeta Warszawska of 1833 helps understand the represented scenes: “Whoever should wish to formulate an opinion on the work of Professor Maliński should first with no further delay read the first scene of Oedipus Rex, a tragedy by Sophocles, since it lends its theme of the entire piece.” In the prologue the residents of Thebes gather to pray in front of altars of deities, begging them to save the city ravaged by plague. The classicist architectural forms, as well as the function of the building, contributed to the choice of decorative themes that bear reference to the history of the birth of Greek theatre. The frieze features scenes inspired by the oeuvre of Sophocles (c. 496–406 BCE), the greatest Greek author of tragedies; the tympanum features the image of Anacreont (c. 570 – c. 485 BCE), poet and author of lyrical songs. The rich sculptural decorations on the facade of the Grand Theatre were produced by best Warsaw artists of the time – the lecturers and alumni of the Fine Arts Department of the Royal University: Paweł Maliński, Konstanty Hegel (1799–1876), Jakub Tatarkiewicz (1798–1854), as well as Italian sculptors Ferrante Marconi (1798–1868) and Tomaso Accardi (or Acciardi, dates of birth and death unknown). The construction of the Warsaw theatre bears connection to the activity of Stanisław Staszic (1755–1826), one of the most significant representatives of Polish Enlightenment, reformer, minister in the government of the Kingdom of Poland. In 1818, Staszic brought to Warsaw the architect Antonio Corazzi (1792–1877), an alumnus of the Academy of Fine Arts in Florence, who was commissioned to design the edifice of the Society of Friends of Science. Two years later, Corazzi was appointed as the general government constructor. In 1825, the architect emerged victorious from a competition announced by the Mayor of Warsaw Karol Woyda (1771–1845) to design the theatre on the site of the former Marywil complex – the 17th-century commercial and service buildings. The monumental edifice was conceived as a crowning achievement in the efforts of the Kingdom of Poland authorities to lend an exclusive appeal to the city. At the same time, since its inauguration in 1833, the theatre served as an enclave of Polishness in the city subjected to the process of Russification imposed by the partitioning power. In 1890, the frieze from the front facade was transferred to the masonry forecourt which was added in the front and crowned with a balcony, where it survived until World War II. 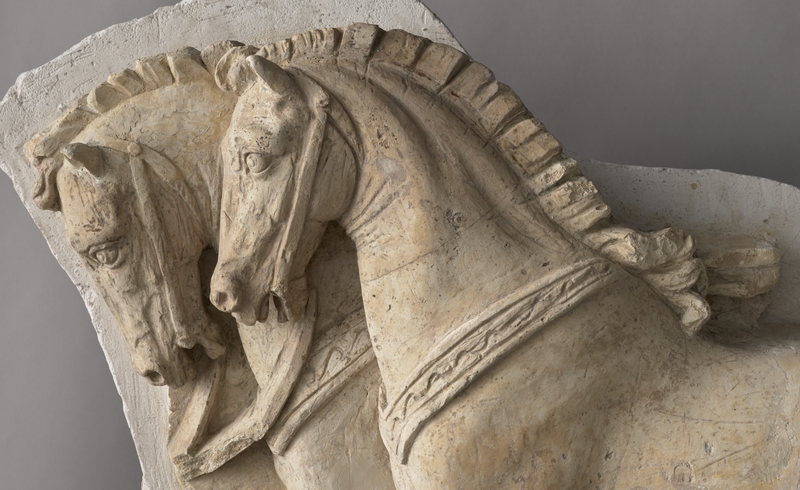 During the war, the fragile stucco decoration was destroyed and later reconstructed in stone during the rebuilding of the theatre (1951), whereas the preserved original elements entered the collection of the Museum of Warsaw. Currently, the holdings boast more than a dozen fragments preserved to a varied degree. 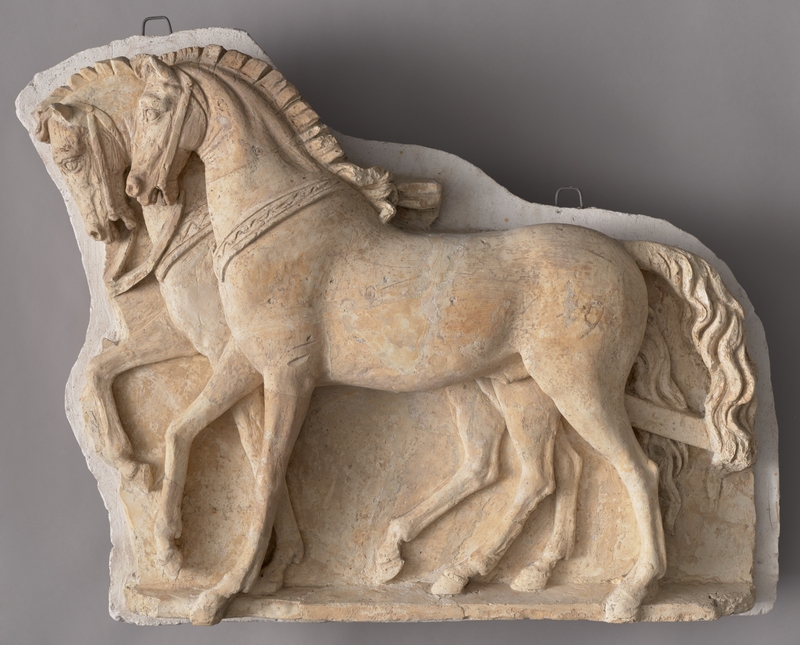 One of the most interesting objects in sculptural terms represents a biga – a two-horse chariot with two wheels, driven by soldiers.